Present state: Demolished - a car showroom now stands on the site but this is now closed and the site is (in 2015) for sale. 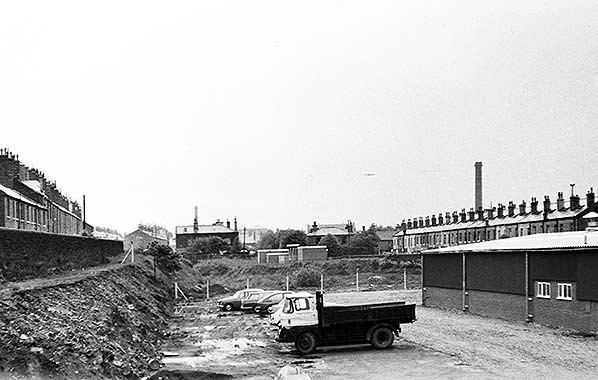 The boundary wall on two sides of the station (Parkinson Road and Aspinall Street) is still intact. Notes: The 2½-mile branch from Holmfield to Halifax (St Pauls) was one of the temporary closures to passengers in World War I which proved to be permanent. It was an extraordinary line which followed an indirect, steeply graded route, including the 819yd Wheatley Tunnel and a 100ft tall, ten-arch viaduct over the Hebble Valley, to end in the suburbs of Halifax some 300ft above the town centre and the existing main railway station. It was also expensive to build and, at first glance, would appear to be an absurd enterprise. However the St Pauls line was part of a bold plan by which the Midland Railway’s Anglo-Scottish expresses could travel by Sheffield, Barnsley, Huddersfield and Halifax, thence via the Great Northern Railway (GNR) Queensbury route to Keighley, and it depended upon the Hull & Barnsley Railway (see South Cave) extending its network via Huddersfield to a new Halifax (Central) station in George Square. 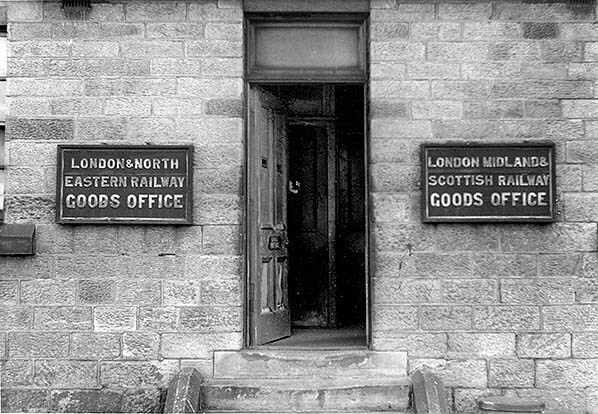 In 1884 a company rejoicing in the name of the Halifax High Level & North & South Junction Railway was authorised to construct 5¼ miles of route from Holmfield, on the Halifax (Old) to Queensbury line, which consisted of the St Pauls branch and another branch to Halifax (Central) where it would meet the Hull & Barnsley’s extension. 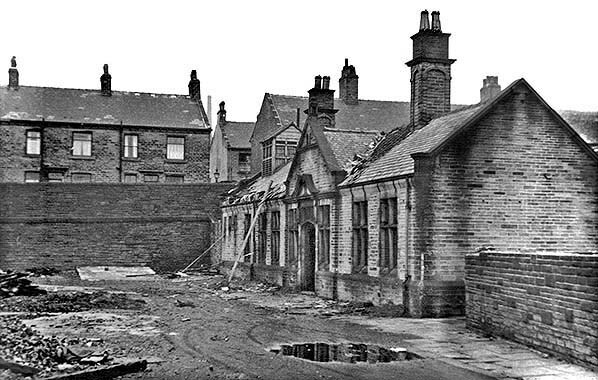 An Act of September 1886 restricted the Halifax High Level project to the Holmfield-St Pauls section, and it would be worked jointly by the Lancashire & Yorkshire and GNR companies; the GNR provided the passenger train services. In 1894 the line was vested in the two companies. Although this modest branch line, without the other to Halifax (Central), had no strategic value it nevertheless made sense on a local level: prior to its opening, the 130 mills in the elevated western suburbs of Halifax had to be supplied with 80,000 tons of coal each year, which had a difficult uphill journey. On 1 August 1890 the branch opened to goods as far as Pellon, ¾-mile short of St Pauls, and to all traffic to St Pauls on 5 September 1890. The service operated as a shuttle between St Pauls and Holmfield’s bay platform, allowing passengers to change there for Bradford trains. In December 1895 there were 13 weekday departures and five on Sunday. In April 1910 the service had reduced slightly to 11 on weekdays, with an extra on Monday and Thursday but still five on Sunday. The trains were of little value to anyone living in the St Pauls or Pellon areas for travel to central Halifax or the ‘Old’ station owing to the indirectness of the route, the need to change trains, and the relative infrequency of the service. By 1898 electric trams had reached the vicinity of St Pauls and Pellon stations providing fast and frequent services to the centre. On various other lines ‘rail-motors’ were introduced to reduce costs, often in connection with opening halts to tap extra traffic; although tried out on the St Pauls branch in 1906 a steam rail-motor was not adopted, perhaps because of the steep gradients of 1 in 35 at Holmfield and 1 in 50 approaching Pellon from the north. 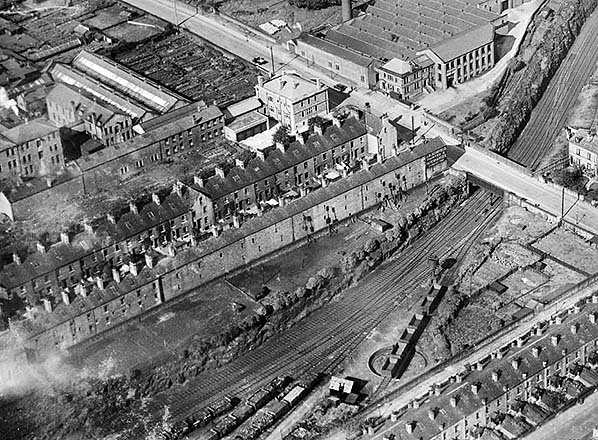 No further passenger stations were opened, although a goods station was added at Wheatley, south of the viaduct. Halifax St Pauls had an island platform with a glazed ridge-and-furrow verandah extending for a little over half its length. 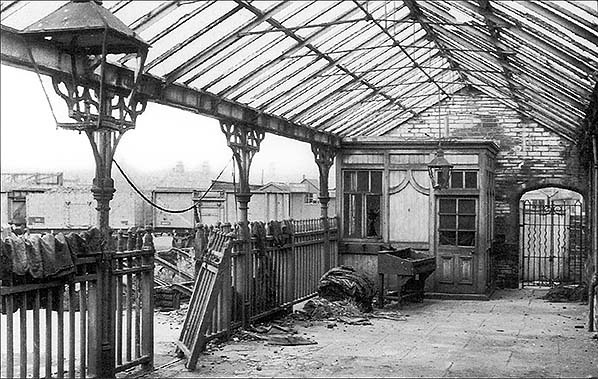 At the southern end a further glazed verandah was provided over the concourse at the head of the platform. The entrance building was a single-storey brick structure with a pitched roof and raised gables, and the entrance was beneath a cross-gable. Four goods sidings were found east of the passenger station, and north of the station, adjacent to the signal box was a further siding approaching the turntable. Many lightly used stations closed on 1 January 1917 to release railway staff for military service, and the St Pauls branch lost its passenger service on that date. Although freight continued to be handled, only occasional excursions used the line. After passenger closure the branch was singled and most of the signalling was dismantled. A Stephenson Locomotive Society special is understood to have been the last passenger train to visit St Pauls, on 6 September 1953. The freight services on the line ended on 27 June 1960 and the facilities at Wheatley, Pellon and St Pauls were closed. St Pauls station building is thought to have been demolished in, or shortly after, 1963, and the rails were probably removed by the mid 1960s. The north end of the station site was redeveloped for housing in the 1960s and 1970s (Kingston Close and Kingston Court). The south end of the was until recently occupied by the DYL Motorgroup car showroom and garage. The 2.14 acre site is (2015) currently for sale. Ticket from Michael Stewart. Route map drawn by Alan Young. The approach to Halifax St Paul's station in September 1931. The station itself is out of view but part of the goods yard and turntable is seen at the bottom of the picture. 1894 1:2,500 OS map. St Paul's consisted of an island platform terminus with access to the booking office from a forecourt off Parkinson Road. The goods yard is to the,east of the passenger platform and comprises three parallel sidings and a turntable at the north end of the yard. A signal box was provided alongside the turntable road just to the south of Hopwood Lane bridge. A weighbridge and office (WM) is shown at the south end of the yard. 1907 1:2,500 OS map. Little has changed since the earlier map apart from the addition of a fourth parallel goods siding.The glazed canopy over the platform and concourse is clearly shown by hatching. 1963 1:2,500 OS map. This map was published in 1963, three years after the line closed completely; the survey was, however, probably made a couple of years earlier. The railway is shown as 'disused'. The canopy over the platform has been removed but that over the concourse is still shown. All the track is still in place but the turntable has been removed although its position is evident. The signal box has also been demolished. 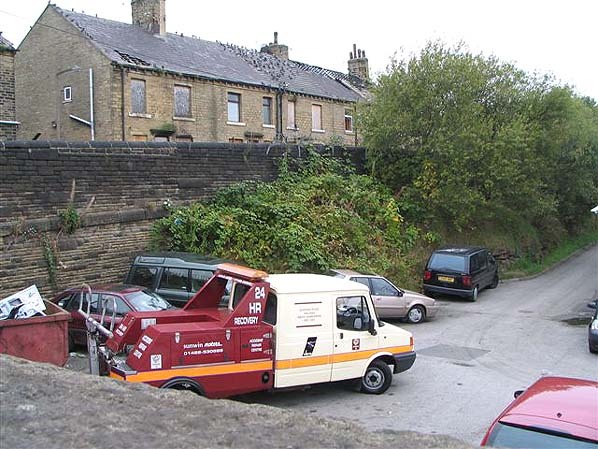 The branch was operated jointly by the Great Northern and Lancashire & Yorkshire railways and continued under dual management until 1923, by which time it dealt only with freight traffic. The signs seen on this undated photograph indicate the interests of the LNER and LMS in this somewhat obscure station. remained in use until 1960. More than 30 years after it closed to passengers St, Paul's station welcomes the Stephenson Locomotive Society (N.W. 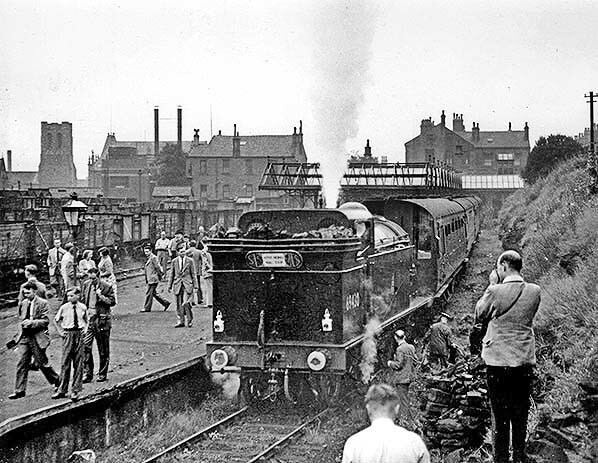 Area) / Manchester Locomotive Society 'West Riding Rail Tour' from Leeds City on the afternoon of 6 September 1953 hauled by GNR-built Class N1 0-6-2T No 69430. The concourse at the end of St. Paul's platform in 1958. 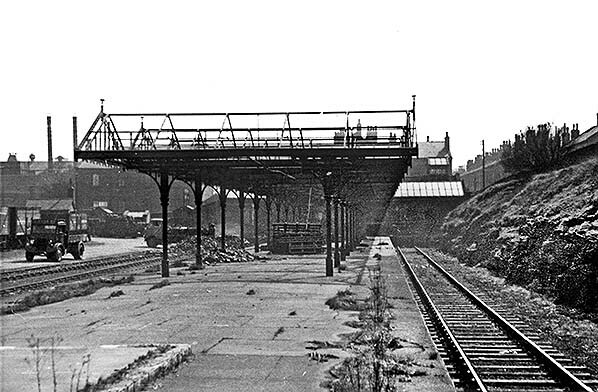 By this time the canopy stretching along half the length of the platform had been demolished. 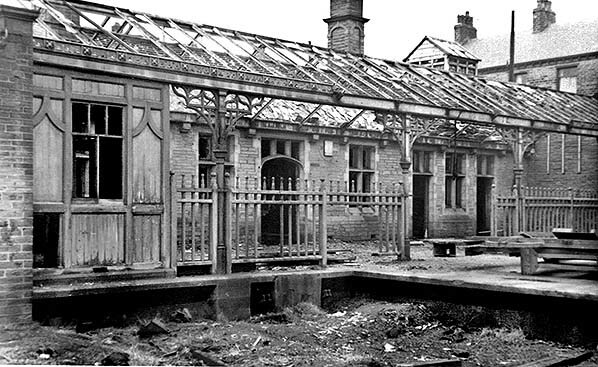 Another view of the small concourse at the south end of the passenger platform in June 1963 shows that the brackets supporting the glazed verandah have quite rich ornamentation. This photo of the road frontage of St Paul's was taken in June 1963 and it is thought that the demolition took place soon afterwards. 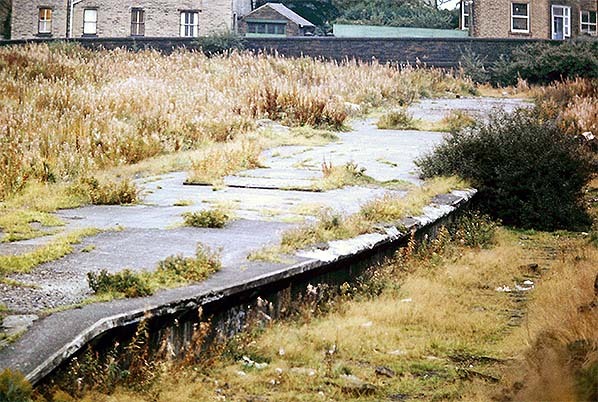 The abandoned north end of St Paul's platform and overgrown station site in October 1971, shortly before the site was redeveloped. The Kingston Court housing development seen in the background occupies the middle section of the platform. The site of St Pauls station looking north from Parkinson Lane in June 1962. 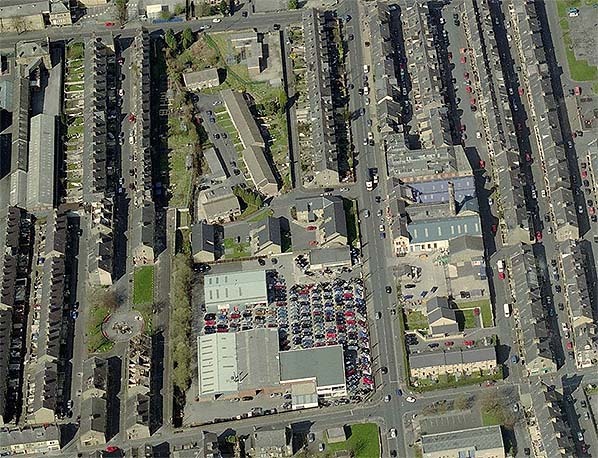 Aspinall Street is seen on the left and Queen Road on the right. The south end of St Paul's station site seen from Parkinson Lane in October 2005. The boundary wall along Aspinall Street is seen. Aerial view show the car showroom built on the south end of the St. Paul's station site. By 2015 the cars had gone and the site os for sale. Between the showroom and Hopwood Lane housing in Kingston Close and Kingston Court occupies the site.